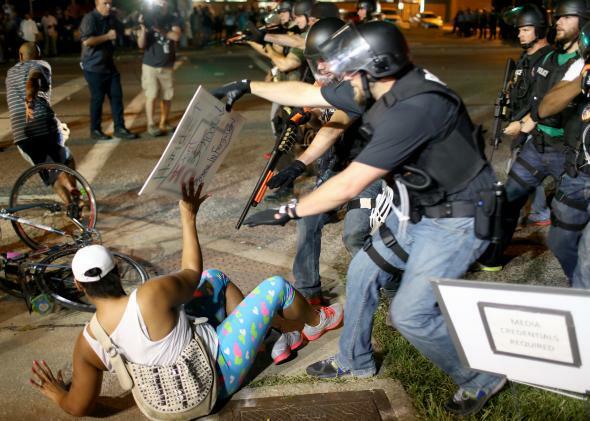 Justice Department: Ferguson violated blacks' civil rights repeatedly. The Ferguson Police Department seems unaware of the First Amendment. Also the Fourth, Fifth, Sixth, Eighth, Thirteenth, and Fourteenth. [O]ver the past two years, African-Americans made up about two-thirds of the city’s population but accounted for 85 percent of traffic stops, 90 percent of citations, 93 percent of arrests and 88 percent of cases in which the police used force. Black motorists were twice as likely as whites to be searched but less likely to be found in possession of contraband such as drugs or guns. Blacks in Ferguson were 68% less likely than others to have their cases dismissed by the Municipal Judge and were disproportionately likely to have a warrant issued against them, according to the report. As recently as 2013, 96% of the people who were arrested on an outstanding warrant were black. But even more than the treatment they received once stopped, the Justice Department’s report found that blacks were used in the criminal justice system to buoy the city’s economy and balance its budget. The practices uncovered by federal investigators have violated residents’ Constitutional Rights of due process and equal protection under the law. The DOJ’s report found that blacks were also subject to unfair stops and arrest for minor offenses like “manner of walking” in a roadway. As my colleague Josh Voorhees explained Monday, the Justice Department will likely use this report to pressure local officials to enter a “consent decree,” requiring them to cooperate with the feds to reform their practices. If Ferguson refuses to play nice, the Justice Department will almost certainly launch a federal civil rights lawsuit against the city.